A massive wildfire rages Wednesday evening, May 4, 2016, near Anzac, Alberta, a hamlet 48 km southwest of Fort McMurray. The community and surrounding area was evacuated. A state of emergency exists in the Regional Municipality of Wood Buffalo as a result of wildfires. Two years after the devastating wildfire that forced 88,000 residents of Fort McMurray, Alta., to flee their homes, the city has made great progress in its recovery. Along Highway 63, which runs through the city, the trees in June were bare with no green of their own, but grass and low-lying brush were returning. 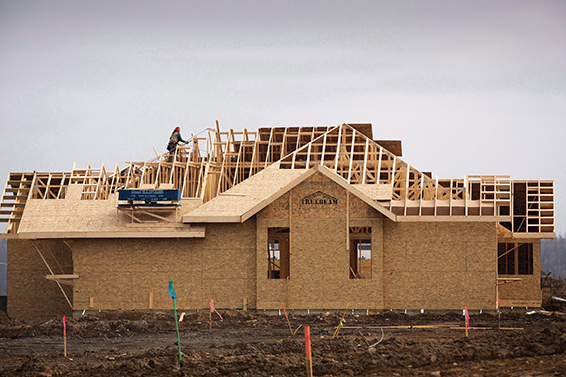 The city itself is in a building boom, caused not by growing fortunes in the nearby Athabaska oil sands, but by insurance claims settled and homes being rebuilt. It is a story of survival and recovery, of military assistance, of co-ordination between municipal, provincial and federal agencies and of neighbours helping neighbours. In many ways, it is a home-front story of proportions not seen since the world wars. “It is a story of a truly Albertan response. Or a truly Canadian response,” said Mayor Don Scott of the Regional Municipality of Wood Buffalo, which includes Fort McMurray and its surroundings, 435 kilometres north of Edmonton. The potential for a fire in the spring of 2016 was high. The northern boreal forest, with its predominance of black spruce, provided highly flammable fuel. Humidity was low and temperatures were in the 30°C range. The fire started April 29 along the Horse River Trail System, a cleared pathway for power lines and a popular spot for ATV riders. Given the clear skies of the day, it is believed that the fire was caused by human activity, such as a discarded cigarette or a spark from the exhaust pipe of an ATV. Exactly what is unknown. By May 1, firefighters were battling three wildfires near the city, which has a permanent population of 81,948 and a transient population, mostly working in the oil industry, of more than 43,000. The trailer park neighbourhood of Gregoire south of the city had already been issued a mandatory evacuation order. Firefighter Pat Duggan, who is also president of McMurray Branch of The Royal Canadian Legion, was helping his daughter get settled in Edmonton for university when he heard that the persistent wildfires had shifted toward the city. Duggan, a captain with the Fort McMurray Fire Department, joined his team in the local effort while residents were told to stay alert. 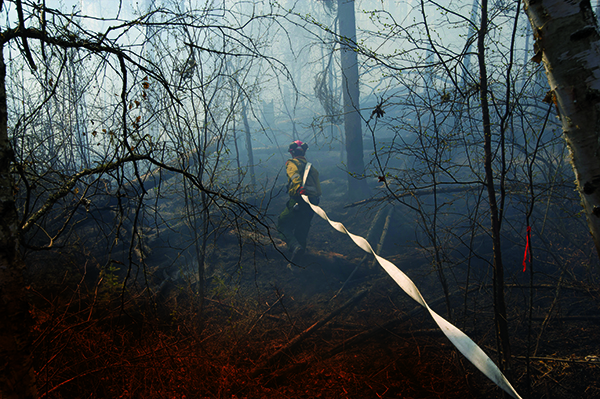 A member of Wildfire Management Alberta’s Wild Mountain Unit out of Hinton, pulls hose through the smouldering forest in the Parsons Creek area of Fort McMurray Friday, May 5, 2016. Fire conditions remain extreme, with 12 new starts across Alberta yesterday. A total of 40 wildfires are burning. More than 1,200 firefighters, 110 helicopters, 295 pieces of heavy equipment, and 27 air tankers are fighting fires across the province. On the morning of May 3, with temperatures continuing to rise, a change in atmospheric pressure known as an inversion caused the fire to explode. 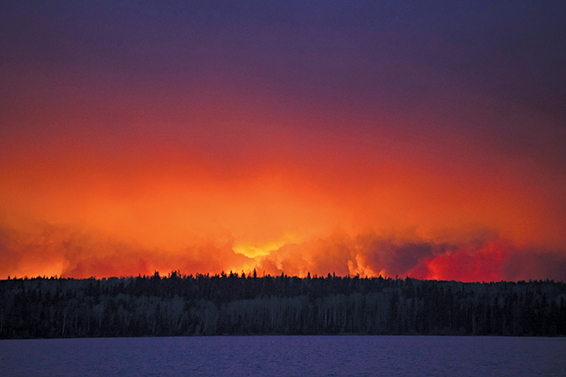 The wind shifted and the fire reached into the city and hopped across the Athabaska River. That afternoon an evacuation order was issued for the whole city. Norm Rockwell of McMurray Branch was out of town when he received a call from his girlfriend telling him she had been given 10 minutes to leave. “I just said, ‘Get your clothes and get out the door.’” He eventually met up with his girlfriend and they stayed in Edmonton until they were able to return. Amanda Colger, bar manager at the Legion, said she spent the day listening to the radio. “I could see the clouds and smoke and then I saw the fire. We decided to pack. I got my daughter and her child into the car and we headed north,” she said. She stayed with her in-laws until there was a chance to join a convoy going south. Eventually she went to British Columbia and only returned to a new home in Waterways in February 2018. 15 minutes to get into a school bus. I took my computer, an extra shirt and my toothbrush,” he said. The bus took them to some temporary housing near the Suncor plant. “We arrived at 8 o’clock at night. We were treated like royalty. “The next day, we got back on the bus and went to Lac La Biche for a night’s accommodation and there were clothes for us at no charge,” he said. Laxton was temporarily settled in a small community south of Edmonton. After six weeks, he was restless and hopped a bus bound for Fort McMurray. He got there but his residence was still being restored. The Legion helped get him a hotel room until his place was ready. Just as the elderly were looked after, so were the students in school. “When the fire broke out, I started making lists, making sure we knew where every student in our system was. The parents weren’t able to get their kids,” said Doug Nicholls, the superintendent of schools with Fort McMurray Public Schools. Children were formed into what they call a “walking bus,” where the kids would walk in rows as they moved from the buildings into buses. He remembers it took three hours to go seven kilometres. “On top of it all, it was a very hot day,” said Nicholls. The students were shuttled around to various locations. “We had to tell parents, ‘If you can’t find your son or daughter, don’t worry. There is no one who is unaccounted for,’” said Nicholls. Nicholls and his staff eventually set up an office in Edmonton to supervise the return to schools and oversee repairs and cleaning up. On May 4, the Alberta government called a provincial state of emergency. At that point, the Canadian Armed Forces were brought in to support civil authorities. Other tasks assigned to the squadron included night mapping to see where the fire was and what path it was likely to take in the morning. When Premier Rachel Notley visited the area, 417 provided the helicopter to show her the damage first-hand. Builders work on a new home in the Beacon Hills area after wildfires last year destroyed most of the neighbourhood in Fort McMurray, Alta. Friday, April 21, 2017. Meanwhile, Duggan and his fellow firefighters were trying to save as many homes as possible. After the first day, the department had lost its water pressure and the firefighters had to depend on water from the trucks. He remembers being in neighbourhoods and hearing explosions, one at a time, as the fire consumed barbecues outside the houses. “It was like walking through a volcano,” he said. It soon became obvious that the battle was not going to be a short one. Something was needed to keep up the spirits of the first responders. “About 20 members of the fire department lost their own homes. Houses were either saved completely or burned completely,” said Duggan. Then they had a simple idea. “We went to the Legion and got Canadian and Alberta flags to put on our trucks. It was a real morale booster, not just for the firefighters but for everyone who saw us,” said Duggan. McMurray Branch is in the oldest section of the city, known as Waterways, along the banks of the Athabaska River. During the Second World War, it was to Waterways that the supplies were brought for the American consortium that was contracted to build the Canol Pipeline, which would move much-needed oil from Norman Wells in the Northwest Territories, through 825 kilometres of mountains and muskeg to Whitehorse in Yukon for those working on the Alaska Highway. By some fluke of the winds and conditions, the fire completely surrounded the branch but did not burn it down. It and three adjacent buildings were the only structures left standing in Waterways. One of the lasting images of the fire was a photograph, carried by several newspapers, of the branch’s Canadian flag defiantly blowing above the dark smoke. Throughout the emergency, Great Plains Security and Consulting provided security in the affected area. “At the time of the evacuation order, we were providing security at a trade show with 350 vendors at MacDonald Island Park [a recreation centre]. Within two hours, we had all the exhibitors on the highway,” said owner-operator Larry Farough. After the evacuation, Great Plains had to secure the area where the firefighters were staying. “We had to make sure that they had food, water and a safe place to sleep,” said Farough. MacDonald Island Park became one of the bases of operations. With grocery stores and restaurants evacuated, the food stocks were at risk of going to waste. “We had some fabulous dinners,” said Farough. “We had to secure the whole town. Mind you, there are only two roads in and out,” he said. There was no loss of life attributed to the fire. Two people, however, were killed in a car accident during the evacuation. More than 2,000 firefighters from across Canada and the United States, and a crew of 300 from South Africa came to battle the fire. While the neighbourhoods of Abasand, Waterways and Beacon Hill were hit the hardest, the fire stayed away from the city core. In the end, about 2,400 structures were destroyed. The Insurance Bureau of Canada called the fire the costliest insured natural disaster in Canadian history. There was an estimated $3.6 billion in insured property damage, while the total losses from the fire are estimated at $8.9 billion. While the fire continued to burn and was not classified as under control until July 4, residents whose homes were still intact were allowed to start returning on June 1. “We had to re-establish accommodations. Eventually, we got power going and gas back at the stations. The grocers came back so people could buy groceries,” said Farough. The downtown area was restored first and then residents of certain neighbourhoods were phased in over the rest of the year and into 2017. Soil and ash had to be tested in some areas before residents were allowed to return and start reconstruction. Ingrid Blasius, assistant manager at the seniors residence where Laxton lives said the residence was saved but suffered damages. “The kitchen was a mess. All the food went to waste,” she said. The staff came in and did the cleaning. On Aug. 27, the city’s recovery was signalled when McMurray Branch once again raised its flag. “We are looking at the recovery as a five-year plan. We’re about halfway through it now,” said Scott. About 1,000 families lost their homes. The municipality is planning its first census since the fire to find where they are. “We have lost some of the population, probably about 10 per cent,” Scott estimated. Work is being done to improve the city’s infrastructure so that such a disaster does not reoccur. “We need to protect the community by making a buffer. There has to be a minimum of 30 metres between any structure and the forest. We have thinned out a lot of the trees to reduce the fuel [for the fire],” said Scott. Patience Akenbor, operations director for Some Other Solutions (SOS), the society for crisis prevention, said youth in the city are still dealing with the effects of the fire. Legion donations have helped SOS go into schools and start programs to help prevent crises. A program called PIE, Partners in Education, which provides students with extra time with their teachers to get through the school year successfully, was also supported by the funds. With a grant from the Legion, the public schools set up a program called Learning Bridge. It offered students extra classes on weekends and after school to bring them up to date to move on to the next grade. Over the fall, winter and spring of 2017, 192 students received support and 307 high-school students received exam preparation support in January and June.